Alex, an African Grey parrot, who was the subject of 30 years of groundbreaking research on cognition and communication has died last Friday at the age of 31. He had appeared healthy and necropsy showed no obvious cause of death. Dr. Irene Pepperberg bought Alex at a pet store 30 years ago and began training and studying his understanding of language and concepts like “same” and “different”. He had a vocabulary of about 100 words, could understand quantities up to 6, could identify 50 different objects, 7 colors, and 5 shapes. In 2005 he displayed understanding of the concept of “none”. Alex also coined his own word “banerry” for apple. He knew the words “grape”, “bannana”, and “cherry”, and combined “banana” and “cherry” to form “banerry”. According to The Alex Foundation, he was fond of cardboard boxes, keychains, and corks. Here’s an amazing, informative video of Alex, his training, and the research from the PBS show Scientific American Frontiers. I’m so sorry to hear about Alex’s demise. I was a big fan. 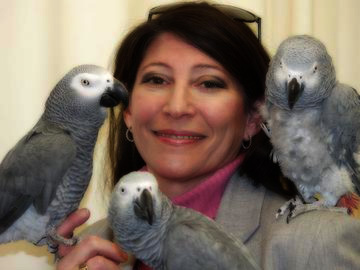 Dr. Pepperberg contributed greatly to the understanding of the intellegence of the African Grey parrot.